Since arriving in Siem Reap, Cambodia, The Kingdom of Wonder last September I’ve been itching to get out and explore. I’m also keen to share what this beautiful country has to offer aside from the Angkor Temples and The Killing Fields. Whilst these are absolute musts, there’s a whole lot more to Cambodia, much of it off the beaten track, away from the tourist hoards. With that in mind, this series was born. One or both of us will endeavour to visit and write about one off the beaten track place here every month or two. The aim being to encourage people to stay longer in Cambodia and see some of it’s less touristy offerings. 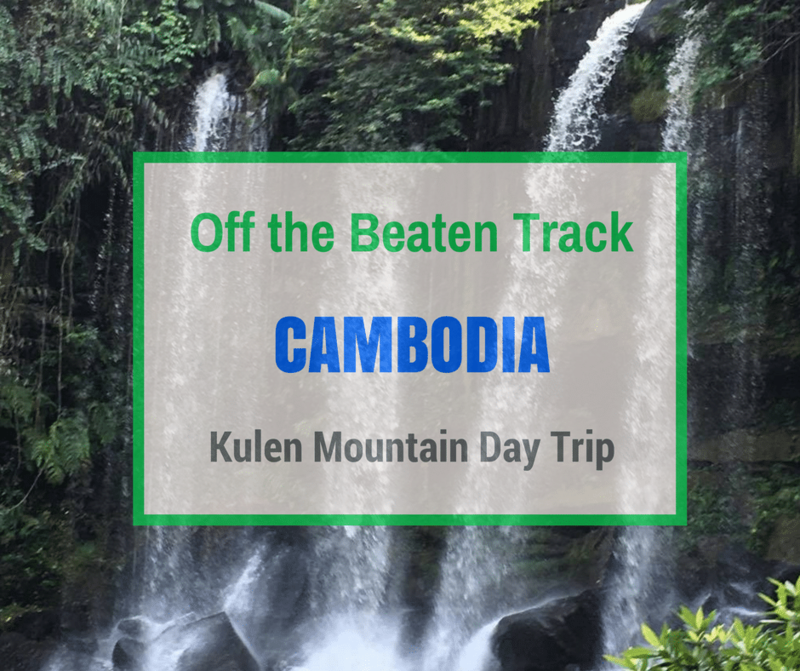 First up is Kulen Mountain, where a group of us went on a day trip from Siem Reap. Siem Reap is as flat as a pancake, but 40 km to the North East of Angkor Wat, in Svay Leu District is Phnom Kulen National Park. The small regular shaped plateau of the Phnom Kulen mountain range protrudes from the landscape, nestled amongst thick jungle. Locals consider Kulen Mountain or ‘Mountain of Lychees’ to be the most sacred mountain in Cambodia. It’s frequently visited by Buddhists and Hindus’s in pilgrimage. On top of the plateau is a sacred hilltop with about 30 ruined temples. Much of the land is yet to be de-mined, which means currently, the public can’t visit many of the temples, and definitely not without an expert guide. The entrance fee for Phnom Kulen National Park is not covered by the normal admission ticket or ‘Angkor Pass’, there is a separate admission fee. For foreigners, this is $20 USD (£16), if bought at the gate. Alternatively, ask your driver or guide to purchase it for you from the City Angkor Hotel in town for a reduced rate. Elephant statues – symbols of Hinduism stands at the foot of Mount Kulen. Preah Ang Jub – is reached via muddy tracks, obstacles such as fallen trees and roots and challenging steps. It has a pool of sacred water whose source is at the top of the mountain. Buddha devotees offer prayers here. On our day trip, due to limited time, we skipped the hike. Instead, we drove straight up the mountain to the car park. From here you can either walk or drive (or a combination of the two) between the different things there are to see and do. Built on a massive sandstone rock is the 16th Century Preah Ang Thom Monastery. 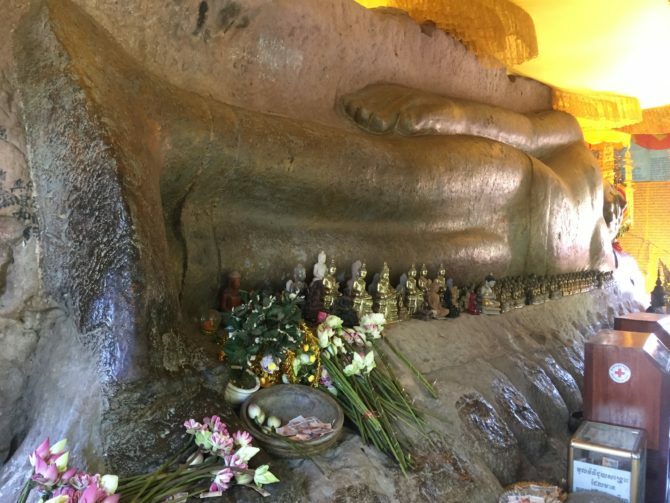 This houses a huge gold reclining Buddha, again, carved out of sandstone. The monastery is reached via a flight of stone steps. The approach is lined with stalls selling offerings, such as flowers, fruit, fake 100 riel notes, and incense sticks. 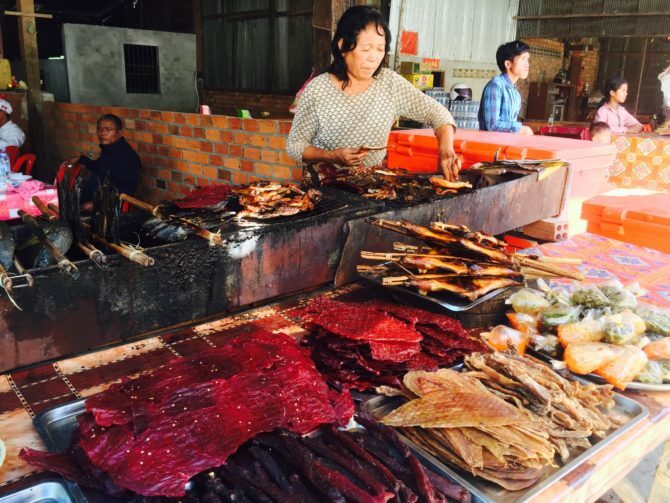 There is also a good selection of food and drink stalls, the smell of BBQ meat wafting past is enough to tempt any meat eater. Either side of the steps are carvings of animals. These include a lion, a dragon, Garuda (a mythical bird-like creature), a tiger, and also snakes which form the railings leading up the hill. Several children and beggars perch on the steps and the heavy scent of burning incense hangs in the air. Shoes must be removed, and left with piles of others, before entering the sacred area around the monastery. You then pass under the rock on which the buddha reclines. Here are several smaller buddhas and many devotees stop to make a prayer and offering of merit. It was quite busy during our visit due to it being Chinese New Year, so we had to join quite a queue to enter the pagoda and file past the Reclining Buddha. Once outside again there is a great view across Phnom Kulen National Park and the jungle below. Carved in the riverbed that passes through Kulen Mountain are thousands of ‘lingas’. These are phallic, fertility symbols of Shiva the Hindu god. They are a pattern of large bumps on the sandstone riverbed, usually on a base of the female version the ‘yoni’. It’s said they bless or fertilize the river as it flows over them to Angkor, into Siem Reap, and onto the Tonle Sap Lake. This is a nice spot to get out of the scorching sun and walk along the river in the shade of the trees. Some enterprising locals have even constructed what we called the ‘love seat’. A wooden swing seat covered in flowers, where you can sit for a photo moment for 1000R ($0.25 USD or £0.18). Slightly touristy but a bit of harmless fun nonetheless. After all that walking around sightseeing you’ll be ready for some food and a rest. 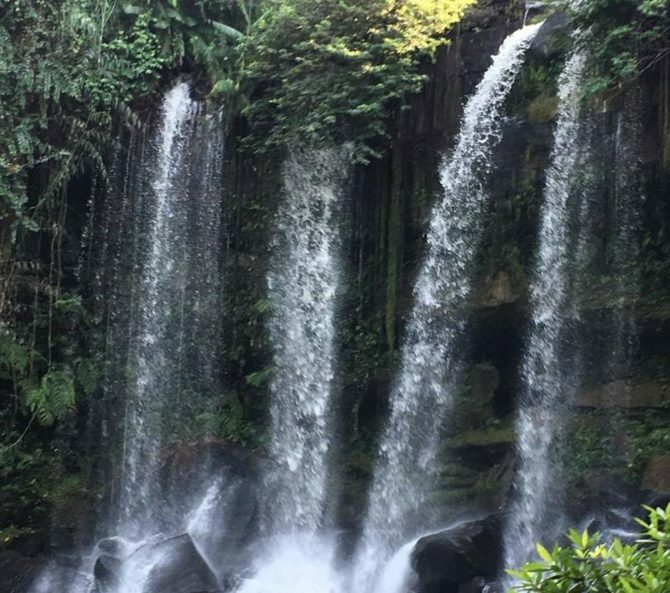 There are two waterfalls at Kulen Mountain, a small one of 5 metres, and a bigger one of 20 metres further down. To the side of the smaller waterfall are several raised platforms, where you can relax and order local food and drinks. People-watching opportunities are also good here, especially during a public holiday. Local families sit on the platforms eating, drinking, chatting and playing cards. To reach the bigger waterfall you have to descend some precarious metal steps, which can get slippery. At the bottom, there’s a few rocks and a wooden swing, covered in flowers you can sit on to enjoy the view. The braver among you could always join the locals splashing around in the water for a refreshing dip. There are also lockers (i.e. metal boxes with a padlock) where you can leave your belongings, which can be handy. The amount of water is very much dependent on the time of year and how much rain there’s been. We were lucky considering our visit was in dry season – there was quite an impressive cascade. There are many local food and drink options around the car-park area, on the approach to the reclining Buddha and at the top of the smaller waterfall. They range from local snack stalls to BBQs to pop-up restaurants where you can sit and order a full meal. You can also order from a restaurant and have the food bought to your raised platform near the waterfalls. The food hygiene may be questionable and as with much ‘off the beaten track’ local food I wouldn’t be 100% sure of it. When we were there it was busy and everyone was eating so we decided to take the risk. We chose to eat at a raised platform and ordered a selection of noodles, soups, curry and rice to share. They were all good and didn’t have an adverse effect on any of us. If you’re nervous about eating local food you may prefer to take a picnic lunch. As mentioned before most people visit Kulen Mountain as a day trip from Siem Reap. Unless you plan to hike to the top you’ll need to take a moto, car or mini-bus as tuk tuks can’t manage the climb. These can be booked from most hotels, guesthouses and tour agencies in town. The journey from Siem Reap is on a combination of tarmac and unpaved red-dirt roads and takes about two hours by car or mini-bus. An early(ish) start is needed as vehicles can only go up the mountain before 11 am and come back down after midday. This is to avoid them meeting in the middle on the narrow road. Dependent on the time of year the road on the ascent of Kulen Mountain can either become very dusty, coating the roadside vegetation in a thick layer of red dust in dry season or very muddy in wet season. There are a few places en-route to stop for a toilet or refreshment break, which we did a couple of times. Stopping to peruse the family-run roadside stalls selling everything from bottles of gasoline, to beer, to bananas, is all part of the experience. If you have more time and energy you could opt for a trekking, cycling, or motorcycle tour. This could be for one day or multiple days, including overnight camping. These guided tours enable you to get even further of the beaten track. They give the opportunity to see some of the less visited sites of the Phnom Kulen mountain range. This really appeals to me and I’m currently looking into a two or three-day trek. Srah Damrei meaning ‘Elephant Pond’. Found here are impressive stone animals, which are said to be protectors of the mountain. There’s a life-size stone elephant, along with smaller replicas of lions, a cow, and a frog. Bat Cave – this is well known as a place of Buddhist meditation, where the monks also act as guides. Aran Rung Chen and Pa Oung – two more obscure, crumbling, moss-covered temples. Wat Preak Krau – a modern cliff-top pagoda. Whilst I would still consider a day trip to Kulen Mountain as off the beaten track it is becoming more touristy. However, there’s plenty to see and do which makes it a well worthwhile trip and gives you a break from the temples. It would be even better if you have the time to take a multi-day tour of the area. Something else to remember is that despite not being overrun with tourists yet, Phnom Kulen is popular with locals during festivals and public holidays. So if you’re crowd-averse, you may be better off visiting another time. Our visit coincided with Chinese New Year and was busy with Cambodian families enjoying the waterfalls. We found seeing how they were enjoying their holiday added to the experience. 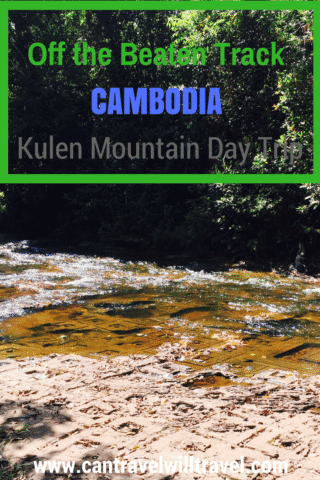 Have you visited Kulen Mountain or Phnom Kulen National Park? Have I missed anything there is to see off the beaten track? I’m planning to visit at the start of July. Do you think it’ll be too crazy wet to check out this area at that time of year? Hi, I think you’ll be ok at the beginning of July as it’s still fairly near the beginning of the wet season! It doesn’t get really rainy until later on! At least it didn’t when we were there! But yes it’s a unique place to visit in Cambodia. I am so glad you shared this. I would love to check out the buddha as well as some of the elephant statues. Just glaf that you choose to share a site other than ankor watt because I am sure Cambodia has so much else to offer. Thanks!! Thankyou! Yes you’re right there’s so much more to see and do here! I’ll be sure to keep posting ? 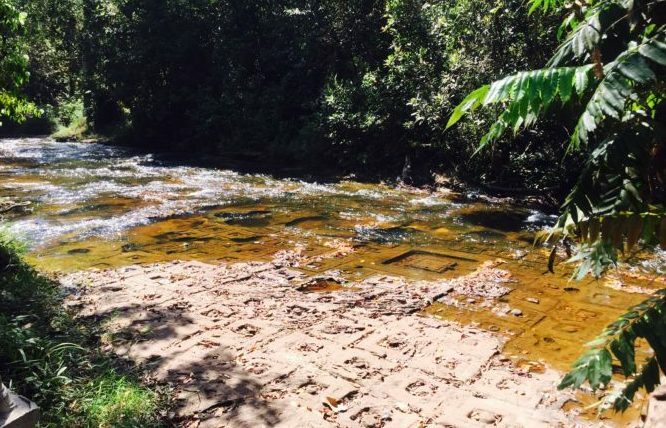 Those lingas are really interesting, I don’t think I’ve ever seen anything carved into a riverbed before. I only had 3 short days in Siem Reap, so I hope to make it back to Cambodia someday for a longer visit! Yes they are interesting. If you do make it back try to visit Kbal Spien too, it’s further downstream from Kulen mountains and has the most amazing riverbed carvings! Best not to go in middle of rainy season though as it’s difficult to see them all under the water. It’s a nice walk/ trek to see them too!